K Nibhanipudi. A Study To Compare The Usefulness Of Double Soft Cervical Collar Versus Hard Cervical Collar (Philadelphia Collar) For Neck Immobilization. The Internet Journal of Emergency and Intensive Care Medicine. 2014 Volume 14 Number 1. Objective: This is a study to compare the usefulness of double soft cervical collar versus the hard cervical collar for neck immobilization. Hypothesis: With the usage of the double cervical soft collar, the degree of immobilization can be achieved similar to that of a hard cervical collar. The study was conducted using healthy volunteers from emergency medicine training residents recruited for the study on a voluntary basis. i. Hard cervical collar was worn normally. ii. 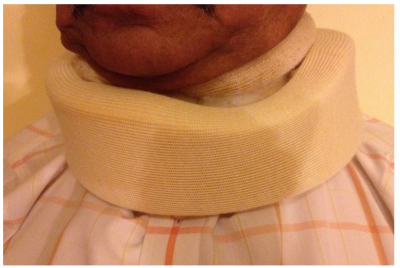 Single soft cervical collar was worn in a traditional manner with the sticky portion to the back of the neck. iii. 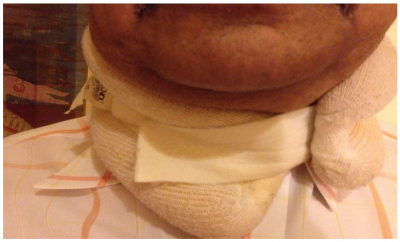 Single soft cervical collar was worn in reverse manner with the sticky portion to the front of the neck. iv. Double cervical collar worn with the first soft cervical collar in the traditional manner with the sticky portion to the back and on top of it, the second soft cervical collar in the reverse manner with the sticky portion to the front of the neck. The participants were asked to score in the score sheet depending upon their subjective feelings with regards to tightness and inability to move the neck for all the 4 forms of cervical collars. The total number of subjects (residents and attending) was 18. They were asked to circle the scores for two subjective feelings in all the 4 varieties of cervical collars. The two subjective feelings were-- tightness and easy movement of the neck. 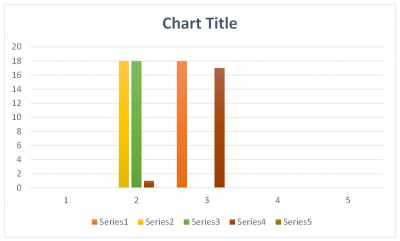 In each of them there are 4 different scores as below. Score 1: Movement of the neck freely. Score 2: Movement of the neck with slight difficulty. Score 4: No movement of the neck. For hard collar: All 18 participants gave a score of 4 for Tightness; and for Movement of neck a score of 3. For single soft cervical collar (worn in both traditional & reverse manners): All gave a score of 2 for Tightness and for Movement. For double soft cervical collar: For Tightness around neck- 18/18 gave a score of 4. For Movement of the neck- 1/18 gave a score of 2 and 17/18 gave a score of 3. Interestingly no participant gave a score of 4 for Movement, with any of the 4 collars. It means they can still move the neck, even with a hard cervical collar. We compared all the scores for different cervical collars for both Tightness around the neck and for Movement of the neck, after wearing collars. 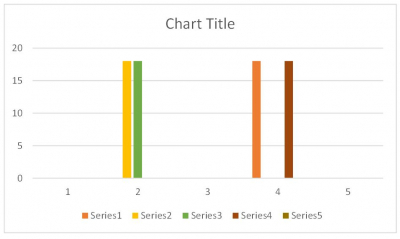 Pearson Chi-square two tailed p-value is <0.0001. According to our study, both the hard and double cervical collars were superior to the usage of single cervical collar. The usage of the double cervical collar is as effective as hard cervical collar. Surprisingly, our study has shown that participants even with the hard cervical collar can move the neck. In real traumatic situations, our study indicates requirement of additional reinforcements to the hard cervical collar, such as sand bags etc. A rigid cervical collar has been traditionally used for traumatic cervical spine injuries. Soft cervical collars were used for unspecified neck pain. But our study will be the first one to compare usefulness of double soft cervical collar versus single soft cervical collar and rigid hard collar (Philadelphia collar). All the ER Residents and attending physicians who are willing to participate. 1. ER residents and attending physicians unwilling to participate. 2. Volunteers with any neck pain due to trauma or unspecified origin. This study was conducted with the healthy volunteers from emergency medicine training residents and attending physicians. The residents and attending physicians were recruited for the study on a voluntary basis. ii. 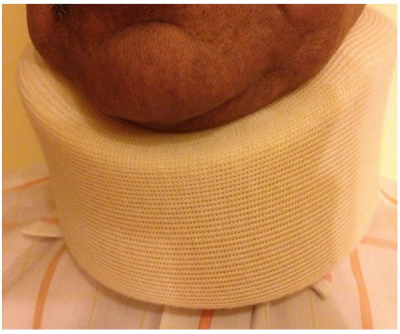 Single soft cervical collar worn in a traditional manner with the sticky portion to the back of the neck. Iii. Single soft cervical collar worn in reverse manner with the sticky portion to the front of the neck. Iv. Double cervical collar- participant wore with the first soft cervical collar in the traditional manner with the sticky portion to the back and on the top of it, wore the second soft cervical collar in the reverse manner with the sticky portion to the front of the neck. The participants were asked to score in the score sheet depending upon their experience with regards to tightness and inability to move the neck with all the 4 forms of cervical collars. single soft collar worn in traditional manner with sticky portion to back. Single soft collar &ndash;sticky portion &ndash; reverse side. Total number of subjects (residents and attendings) is 18. They were asked to circle the scoring number for two different subjective feelings in all types of cervical collars. The subjective feelings were scored for Tightness and easy Movement of the neck. In each of them they are 4 different scoring headings. Score 3: Movement of the neck with great difficulty. For double soft cervical collar: 18/18 had a score of 4; tightness around the neck- 1/18 had a score of 2 and 17/18 had a score of 3. Interestingly no participant gave score of 4 for neck Movement. It means that they can still move the neck, even with hard cervical collar. A-- Hard collar; B-soft collar -- sticky portion to the back .Group c: soft collar-- sticky portion to the front. Group D: double cervical collar. Score 1: no tightness; Score 2: slightly tight Score 3—almost tight; score 4: very tight. Score 1: move the neck freely; Score 2: move the neck with slight difficulty. Score 3: move the neck with great difficulty. Score 4: cannot move the neck at all. Colors indicate: Yellow: soft cervical collar- sticky portion toe back; Green: soft cervical collar-sticky portion to the front; Brown: double soft cervical collar; Red: hard cervical collar. Colors indicate: Yellow: soft cervical collar- sticky portion to the back; Green: soft collar-sticky portion to the front; Brown: double soft cervical collar; Red—hard cervical collar. We compare all the scores with different cervical collars in both tightness around the neck and movement of the neck after wearing collars. The usage of single soft cervical collar is less effective than hard and double soft cervical collars. The Pearson Chi-square analysis with a two tailed p-value for both subjective feelings is <0.0001. Groups: A: hard collar; Group B: soft collar with sticky portion to back; Group C: sticky portion to the front. Group D: double soft cervical collars. Scores: 1. Can move the neck freely; 2: slight difficult to move; 3: great difficulty to move; 4: cannot move at all. Two tailed p-value is <0.001. Scores: 1. No tightness at all; 2. Slightly tight; 3: almost tight 4: very tight – almost chocking. Two tailed p-value is 0.0001. Lots of patients suffer from neck pain. Most of these patients were prescribed some form of cervical collar. Long term usage of these collars is associated with some form of atrophy of neck muscles.1 According to study in Journal of Current Review of Musculoskeletal medicine, 2008, the rigid cervical collars may play a role in managing the neck pain successfully 2. Kontautas et al concluded that non-displaced axis fractures could be immobilized with a rigid cervical collar alone. Additionally, in a retrospective review of cervical spine injuries, the authors concluded that generally, vertical C2 body fractures can be handled without operative treatment. The C2 fractures in the study were immobilized with either a Minerva jacket, halo, or a rigid cervical collar. The recommendations cannot be supported with certainty for any specific device due to small sample size and also study being retrospective nature3. In whiplash patients, most studies suggest that early mobilization and activity is superior to immobilization and soft cervical collar use. However, more recent studies have not found any long-term benefits of early aggressive treatment as compared to immobilization. Therefore, no definite conclusion can be drawn about the efficacy of cervical collars. However, for patients who find it useful for symptom relief, a soft cervical collar for 10 days can be used with no ill effects. Rigid cervical collars have a well-established role in the acute management of trauma patients to prevent instability of the cervical spine. They also may play a role in the conservative treatment of certain types of cervical fractures such as non-displaced axis fractures and C2 body fractures. However, majority of studies were case reports and hence specific recommendations cannot be made from these case reports..
Carter et al studied the effectiveness of soft cervical collars in limiting the range of motion when worn as recommended or reversed. All planes of cervical range of motion of 50 volunteer subjects without any cervical dysfunction were measured under 3 conditions( namely no collar, recommended use and reversed) showed that decreased cervical motion with wearing normal way or reversed compared to not wearing collar in 3 of the six motions5. According to our study, both hard and double cervical collars were superior to the usage of a single cervical collar. The usage of the double cervical collar is as effective as a hard cervical collar. Surprisingly, our study has shown that healthy volunteers even with the hard cervical collar can move the neck. In real traumatic situations, our study indicates additional reinforcements to the hard cervical collar like sand bags etc. 1. Miller CP., Bible CE, Zagade KA,Whang PG Grauer JN,, Spine(Phila ,Pa 1976) 2010 Jan 1:35(13);1271.8 dol 10,1097/BRS Obo 13e 3181cOddad Soft and rigid collars provide similar restriction in cervical range of motion during fifteen activities of daily living. 2. Stefan Muzin, 1 Zacharia Isaac,1,2 Joseph Walker,1 Omar El Abd,1 and Jennifer Baima Curr Rev. Musculoskelet Med. 2008 June, 1(2):114-119. Published online 2007 December 2007 12. Doi; 10.1007/s 12178-00709017-9 PMCID: PMC2684205 When should a cervical collar be used to treat neck pain? 4. Swenson RS, Therapeutic modalities in the management of nonspecific neck pain-Phys.Med Rehabili Cli. N. Am 2003, August 14(3); 606-27. 5.Carter VM, Fasen JA, Roman JM Jr, Hayes KW, Petersen CM- The effect of soft collar used as normally recommended or reversed, on three planes of cervical range of motion. J.Ortho Sports Phys.Ther.1996 Mar 23(3) 209-15. Professor of Clinical Emergency Medicine, NYMC. Metropolitan Hospital Center. Emergency Medicine Dept.